When used in appropriate amounts it encourages “remineralization,” a strengthening of weak areas on the teeth such as the pits and the fissures on the teeth. Fluoride occurs naturally in water and in many different foods, as well as in dental products such as toothpaste, mouth rinses, gels, varnish and supplements. Fluoride is effective when combined with a healthy diet and good oral hygiene. Braces, also called fixed orthodontic appliances, generally come in three varieties: Brackets, metal or plastic, clear or tooth-colored, that is bonded to teeth, Lingual-type brackets that attach to the back of teeth, hidden from view, and Bands that cover most of the teeth with metal bands that wrap around the teeth. All three types use wires to move the teeth to the desired position. 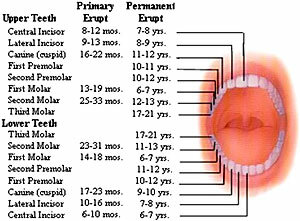 Although teeth are the strongest substance in the whole body, they may chip or break due to various reasons. Some of the most common reasons are biting into something hard accidentally, tooth with a large filling, root canal treated tooth that is not capped and tooth undermined due to decay. What to expect?